Microsoft's crown jewel for building apps that integrate with Office is its Graph set of APIs, which let developers build applications that know how users work with one another. 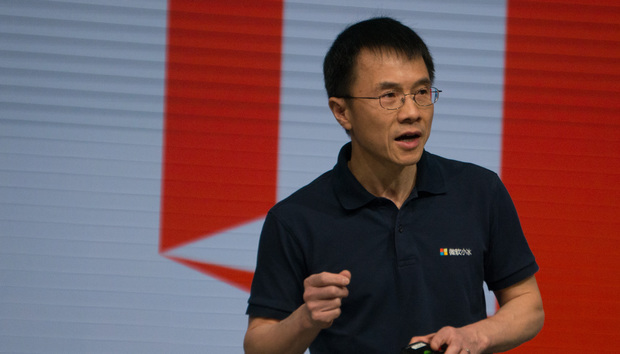 Lu, speaking at the company's Build developer conference, announced six new APIs to improve the Microsoft Graph, including one that allows developers to see when a group of users is available to meet. That functionality will let developers build more intelligent applications that help people who use Office to work together, which can help Microsoft tie customers deeper into its productivity ecosystem. According to Lu, API calls to the Microsoft Graph have been growing 420 percent month over month since it was released last year. The company is also pushing developers to build add-ins for Office applications, like Starbucks, which announced Thursday that it's going to release an Outlook add-in. The add-in will let people easily schedule appointments for nearby Starbucks cafes and send Starbucks gift cards to their coworkers. On top of all that, Microsoft also announced new Skype for Business mobile and web SDKs, which let developers embed Skype calls directly within a Web application or device. That's useful for companies wanting to build applications to connect people with one another through video chat. That's part of Microsoft's push around making conversations a platform for computing, something that has been driven in part by Lu. What remains to be seen is if developers will actually choose to pile into the Office ecosystem. Microsoft clearly has a stake in improving Office's integration with other services, because it can help the company face down Google Apps and other productivity suites, but developers will still need to choose to work with Office.